The evening had begun with a packed demonstration. There was an eclectic mix of people who would be affected by the loss of services and facilities being delivered from five of the buildings on the Tories’ list of those to be "disposed" (See page numbered 229). Young children held placards asking the Tories to let them keep their judo club, others pleaded for their ballet lessons, youth clubs and family support. 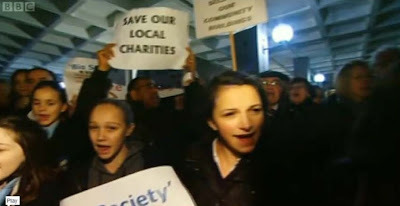 A large group of elderly citizens called for their gym to be kept open while beneficiaries of the charities being booted out of Palingswick House packed the area outside the front of the Town Hall. There were too many groups to mention but all had shared a desperate hope that their buildings and services might be sparred. The night was atmospheric: local musicians who are set to lose their practice venue pounded drums, the beat providing a backdrop to chants of “save our community” and “support our big society.” Large white outside broadcast vans, with aerials reaching high into the night sky, gave the scene added drama. Inside and the Cabinet Meeting had been transferred from a small committee room to the vast Assembly Hall but it was still standing room only. This excellent blog also tells how the meeting played out. The Cabinet Meeting began with presentations from the community groups petitioning their Council to let them survive. Those were business like, at times inspiring and often moving. None asked to continue with the status quo. They argued for a new approach – one that would require H&F Council to work with them so they could buy the buildings and run them as mutualised community trust. Then, when it came to the Opposition's questions Cllr. Greenhalgh announced a new format. He hadn't given any prior notice of this change but insisted that we would now have to ask all our questions in a solid block. No question, then answer, then another question for this Administration. He said if we didn't like it then we wouldn't get a chance to ask anything. Could you imagine the outcry if the Prime Minister did something similar for his weekly questioning? I reminded him that he was seeking to ditch a form of accountability that is the norm for democratically elected politicians around the world and asked him what he was afraid would happen if he answered our individual questions? "Is that your question, he responded." I asked him if he'd guarantee to answer all the questions we asked. He nodded, which I took as an indication that he would and so we went with his format for this occasion. He looked unsure of what he was doing and appeared to be inventing the rules as we went along. Both he and his cabinet colleagues looked extremely nervous. So I asked the Leader of the Council “Would he delay this decision for some months and consider changing his approach so instead of viewing these community groups as opponents they could be seen as potential partners who, with the right support from the council, could put together viable business plans and raise funds to take over their buildings and maintain their ‘big society’ services?" Cllr. Greenhalgh just looked back at me. “Next question” he said. I asked “On the Council’s website it says that if these buildings are not sold you will have to make a further £20 million of cuts to front line services but going by the Council’s own figures it is evident that these buildings would only bring an interest saving of, at the very most, eight hundred thousand pounds – and that’s assuming you immediately sell all the buildings and get the money in the bank by 1st April. So is this £20million figure a mistake or dishonest spin and if not could he explain how his administration came up with this vast sum?" There was a pause then the familiar “Next question” - although it is since interesting to note that the "£20million more cuts" claim has now been removed from H&F Council’s website. By this point I noticed that none of the Conservative Councillors or their officials were making any notes of the questions. 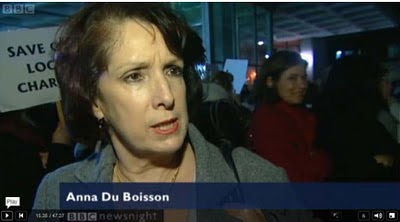 I asked Cllr. Greenhalgh how he was going to answer them. He shrugged. I carried on. “I note that your administration is claiming that no voluntary services will be lost… Tonight, we’ve heard of how those are extremely wide ranging so has the Council carried out an audit of all the services in all these buildings (which I suspect it hasn’t) and if not, how can the Council’s claim possibly have any substance?” Cllr. Greenhalgh paused, checked that was all of the Opposition's questions and began to sum up and move to the vote. I interrupted, asking him if he was going to answer any of the questions put by me, my fellow Labour councillors or the audience. He didn’t respond and the vote went through unnoticed by almost everyone in the hall. It has since transpired that the Council report they voted on is littered with awful mistakes. 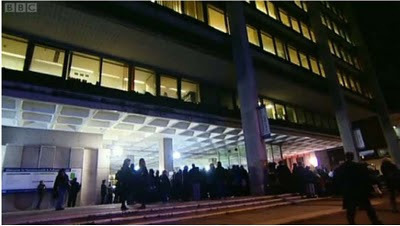 Newsnight were there - as were BBC News, ITV News, BBC Radio, the Guardian and Evening Standard. BBC London covered the story on Monday's evening Drive Time, LBC Radio ran it throughout Tuesday and it was raised by Ed Miliband MP (Lab), on Wednesday at Prime Minister’s Questions. Even today’s Economist refers to it. The London Politics Show had broken the story last Sunday. All wanted to know why Cameron’s favourite Council was shutting down Hammersmith and Fulham’s ‘big society.’ Given all this, I was surprised Cllr. 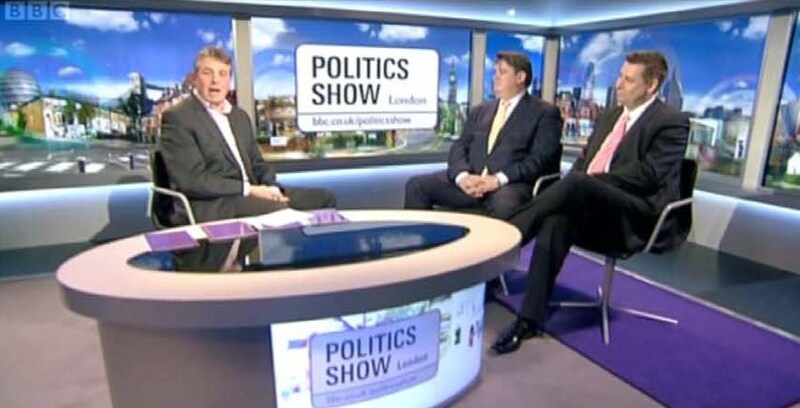 Greenhalgh and his colleagues did not feel up to answering any of the perfectly legitimate questions.